A man, identified as an Anglican Church priest, has set the two Automated Teller Machines installed by Imo Microfinance Bank at Aba Branch in the Ehime Mbano Local Government Area of Imo State on fire, Punch Reports. 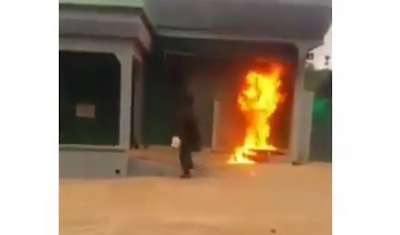 The man, whose action caused pandemonium in the area, equally set his motorcycle on fire before he was overpowered by security men and bank customers. An eyewitness, Kingsley Chukwu, told Southern City News on Sunday that the incident happened on Friday. Chukwu disclosed that the cleric identified as Rev. Chukwunyere Ibezim of St. Stephen’s Anglican Church, Ugiri in the Isiala Mbano LGA, was beaten by an enraged crowd. “Rev. Chukwunyere Ibezim of St. Stephen’s Anglican Church, Ugiri in Isiala Mbano LGA is cooling off his heels in the police net for breaking into the bank in broad daylight with a gallon of fuel and setting the two installed ATMs on fire. “On noticing that people would go after him, he smartly ran out of the bank, set his own motorcycle on fire in a bid to scare people away and took to his heels. “A mob went after him and almost crushed him. It took the intervention of policemen from the Ehime Mbano Divisional Headquarters to save him from being lynched. “The sum of N100,000 was recovered from him. A new hammer was equally recovered from him. He came on a brand new motorcycle which he later set ablaze also,” Chukwu narrated. Chukwu, who lamented the wanton destruction, said the damage would affect the locals as it was the only commercial bank within the area. Imo Microfinance Bank has only three branches in Imo State. The one attacked by the priest is the only one in Ehime Mbano. It is a Rescue Mission Project attracted by the former Transition Committee chairman of Ehime Mbano LGA, Chike Orjiako, who is currently the Senior Special Assistant to the Governor Rochas Okorocha, on Assets and Liabilities. Confirming the arson, the Commissioner of Police in the state, Chris Ezike, disclosed that the medical checks ran on the priest by his command revealed that the suspect was a psychiatric patient.